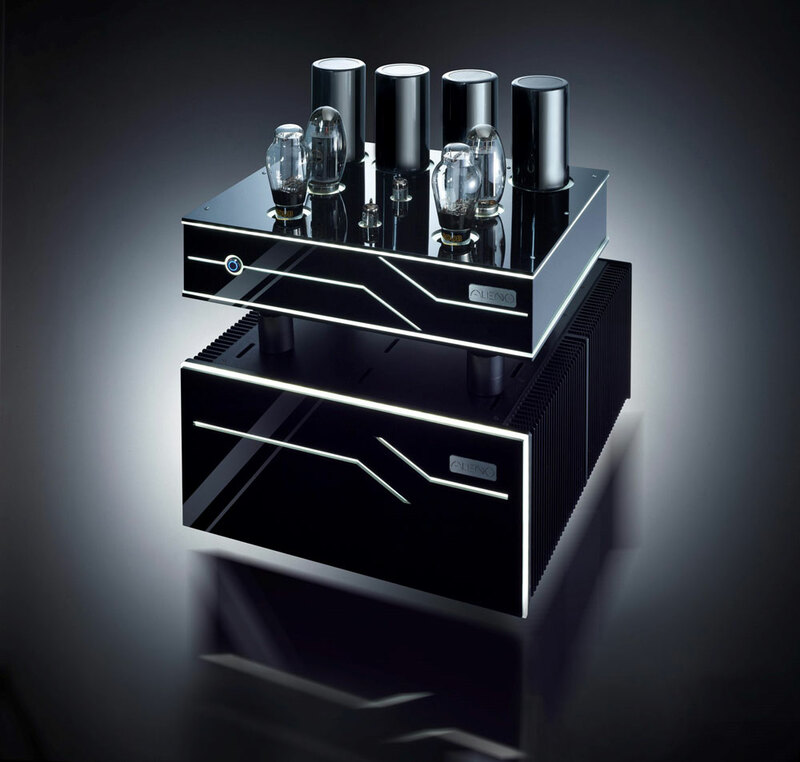 The first tube amplifier utilizing two 300Bs generating 250 Watts per channel. 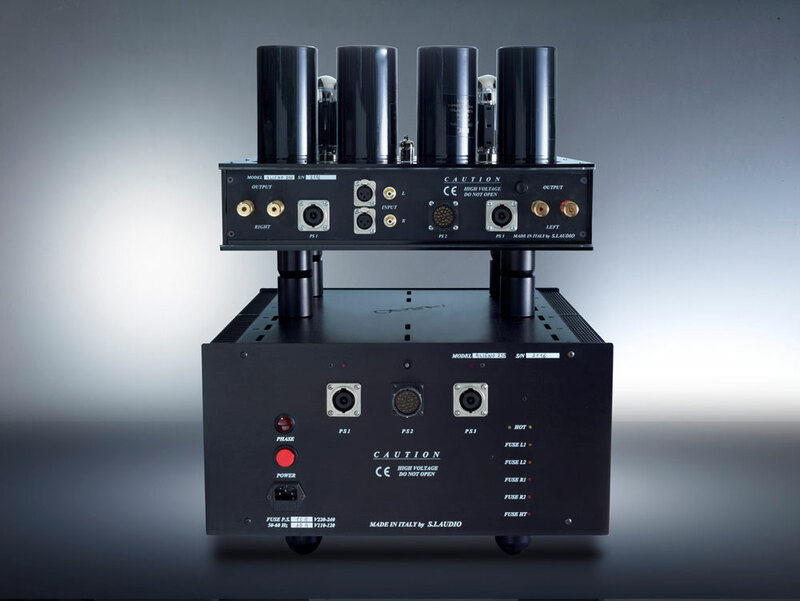 Single Ended, pure Class A amplifier. 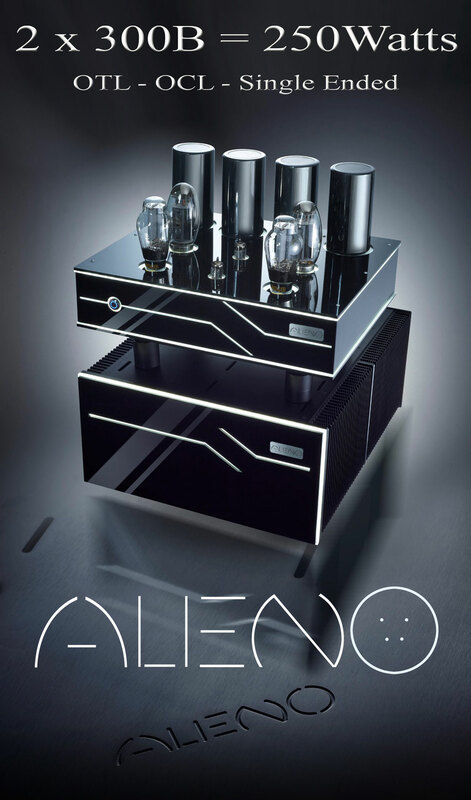 ALIENO is NOT a hybrid tube/transistor amplifier. with transistors used exclusively for power supply and protection circuits. 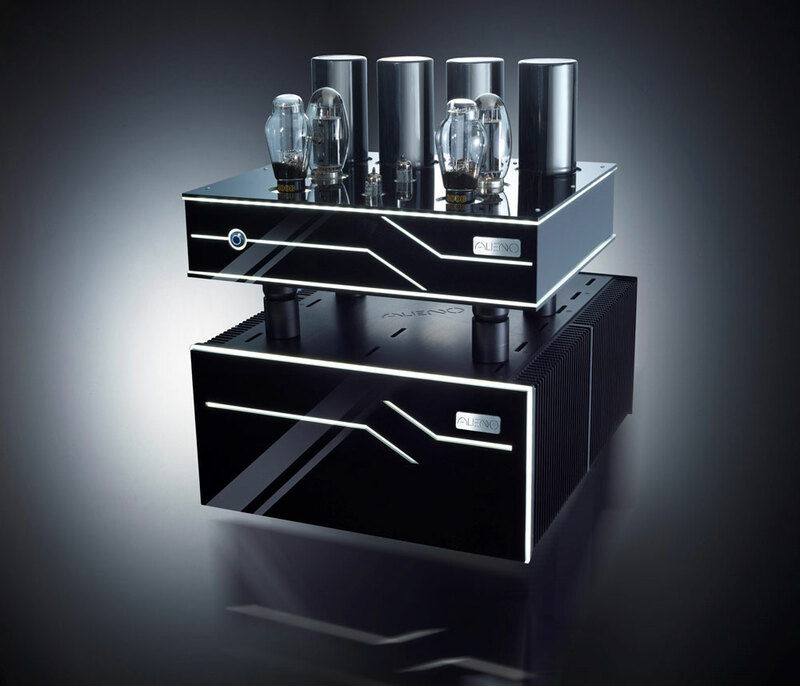 Our exclusive LTD technology in ALIENO was inspired by two primary factors in our study of tube amplifiers. The first is the historical benefit of utilizing an OTL configuration over other traditional approaches. Eliminating the output transformer from the signal path is extremely important. It is in fact the most important component in the signal path where sound transparency is concerned. In its absence, the true sound of tubes can be expressed in all their fullness. re-converted into an electrical signal. After this double conversion, a degradation of the purity and immediacy of the sound is inevitable. single-ended outputs with the elimination of an output transformer. It should also have sufficient output power to drive any reasonable load. These desires were our motivation for inventing the innovative circuitry of the LTD design. where the current is supported by our unique semiconductor power supply process. the most difficult to drive loudspeakers, allowing the full freedom to choose their typology. which in addition to the output tubes, also include the use of transistors. to the solid-state section for current amplification. this generates a partial, but important, loss of the tube signature on the sound. which must not be lost. while the current supply adds the signature typical of transistors. and delivering them unchanged to the speaker connectors. 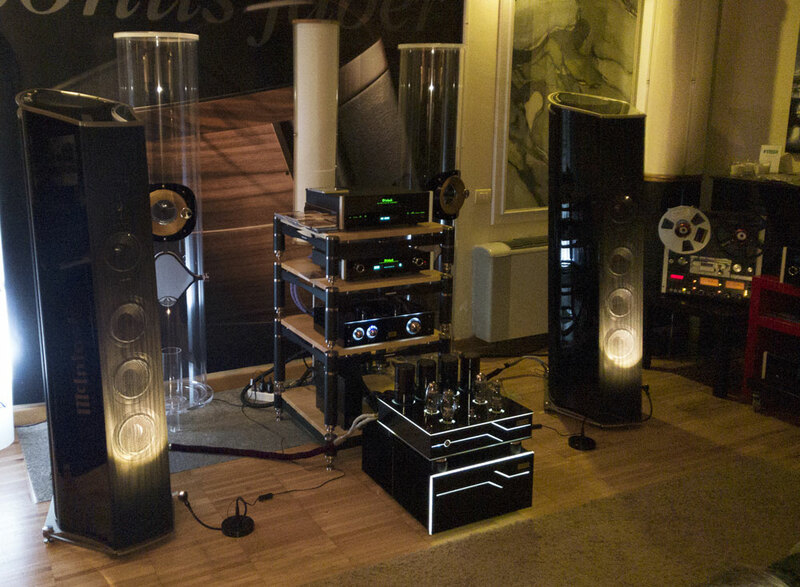 interfacing with the most difficult speakers, and in relation to its intrinsic stability and practicality of use. enviable even for a transistor amplifier, let alone a single ended tube output stage. All this with NO negative feedback. thanks to electronic circuit management of the KT150 tubes. All parameters are constantly optimized over the entire operating life of the tubes. the control circuits allow "Tube Rolling" without worrying about Bias regulation. which being little stressed, will last well beyond their typically rated five thousand hours. In ALIENO 300B dissipation is about 20W, half of the maximum expected by tube manufacturers. active circuitry and precise passive components selected for their sonic purity. just the purity of the original tube sound. (Output Transformer Less & Output Capacitor Less), with proprietary LTD technology. 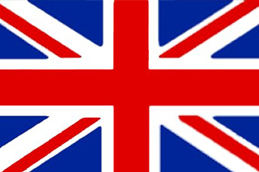 The acronym means: "Loudspeaker Tube Direct". and solid state exclusively for the power supply section. No hybridization of tube and solid state technology. Transistors are utilized for power regulation, stabilization, and safety circuitry ONLY. 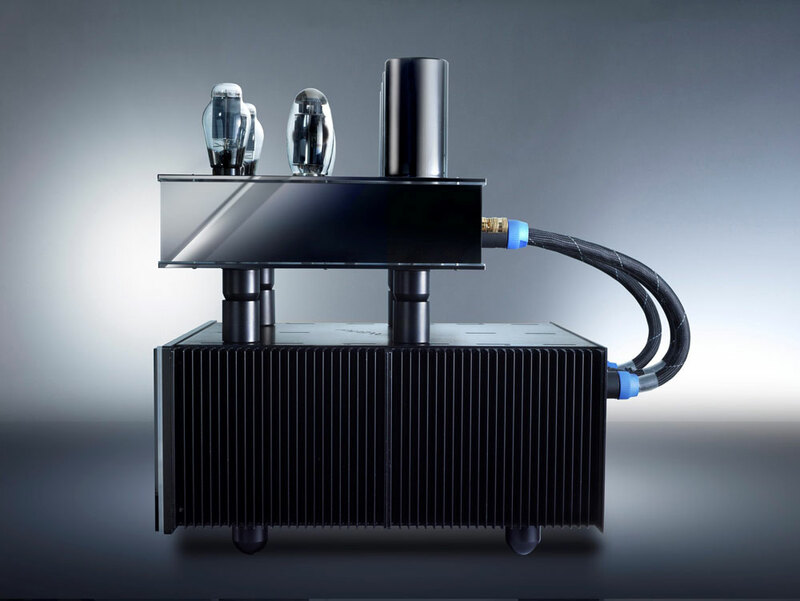 - Power Output: @ 3 Ohms - 250 Wrms continuous per channel. - Distortion: typically 0,1%, max 0,5% from 20 to 20.000 Hz. - Frequency Response: ± 0,5dB from 5 to 100.000 Hz. - Input sensitivity: 2,5 Vrms. - Input impedance: 100 K ohms (irrelevant capacity). - Input connectors: Rca and XLR. - Optimal Load Impedance: 2 ­ 8 Ohm. - Signal to Noise Ratio: > 100 dB. - Damping Factor: > 100. - Overall Negative Feedback: totally absent Negative Feedback. - Slew Rate: > 300 Volts/microseconds. - Output Current: > 100 Amps peak per channel. - Tubes required per channel: one ECC82, pre-ampli and driver tube. one 300B, output power tube. along with real-time output impedance management. Auto adjustment of balance differences between each tube in the circuit. Imprecisely matched tubes or individual tube lifecycle issues are wholly compensated by regulation circuits. - Protection features: Thermal threshold independent for each channel. One AC main fuse and five fuses on each power supply sector. Protection for wrong connection between power supply unit and amplifier unit. Double timer for a gradual loading of the charge on AC power grid. Each protection has its independent warning led, including the fuses. On/Off "thump" eliminated by delay relay transient protection. Amplifier unit, cm. 45 x 50 x 28; inches 17,7" x 19,7" x 11" (W x D x H). Power supply unit, cm. 45 x 60 x 27; inches 17,7" x 23,6" x 10,6" (W x D x H). - Weight: 100 Kg net ­ 220,4 lb. 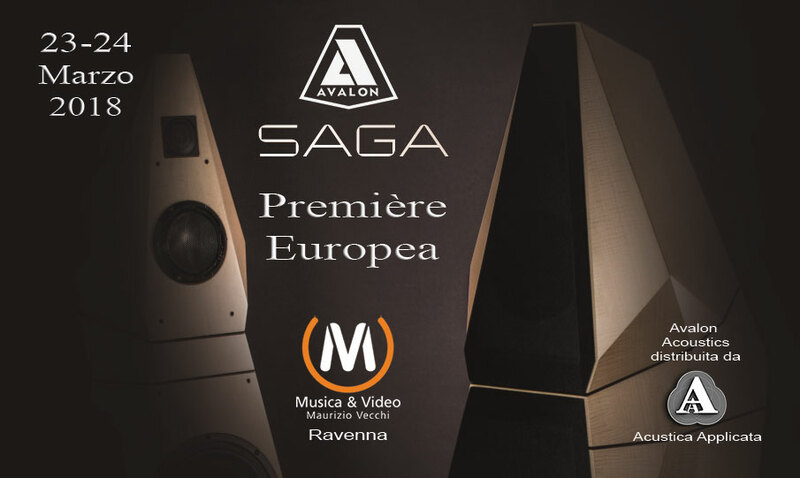 The European premiere of the new prestigious Avalon SAGA took place on 23rd and 24th March 2018, at the certified room Musica and Video of Maurizio Vecchi in Ravenna, where they are now available for permanent listening. 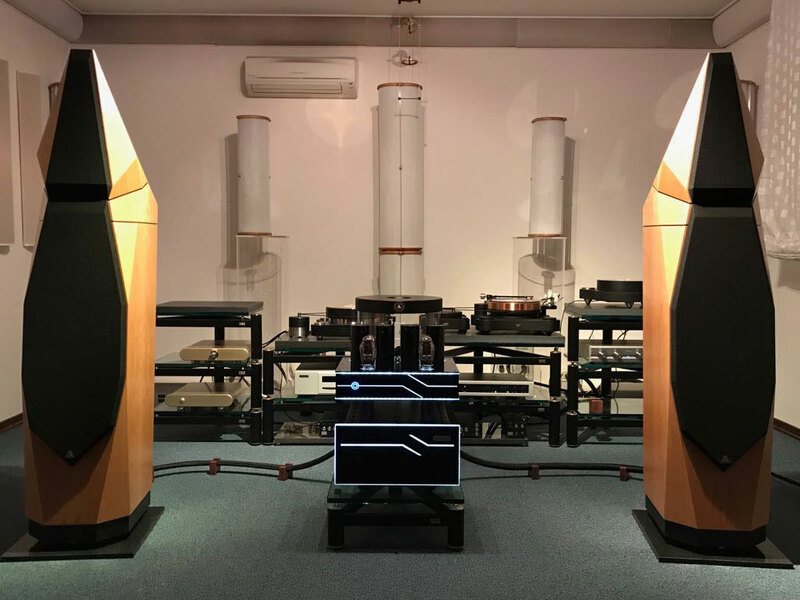 With the following links you can read the first reports of journalists present on the event, followed by those in the paper magazines: Fedeltà del Suono, AudiophileSound, Suono and Audio Gallery. like the one installed by Musica and Video. The in depth knowledge of the reality of the Italian and International market acquired by Acustica Applicata in over 25 years of activity, also allows us to testify that the commercial realities available to the public where you can see and listen a reproduction system and musical media at the maximum quality levels and rarity as by Musica and Video in Ravenna, is an extremely hard-to-find thing, even in countries where high fidelity has made and continues the Hi-End story. 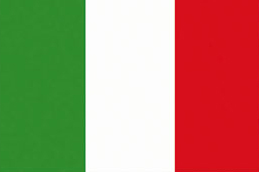 For Italian audiophiles, a "local" privilege envied by many fans all over the world. 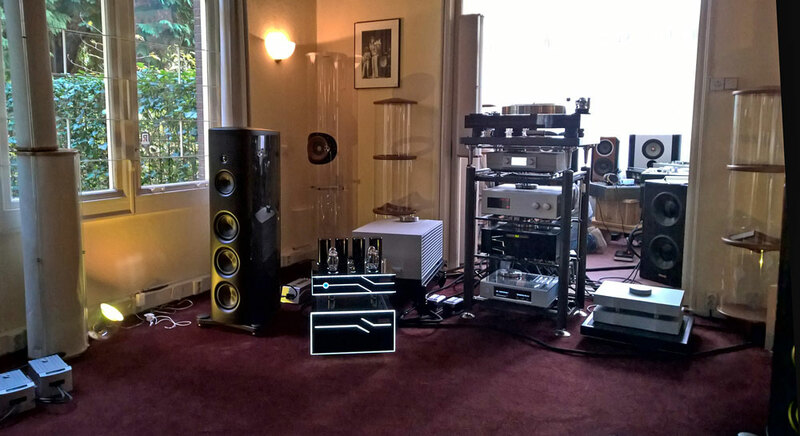 For any audiophile, a listening session at the certified Musica and Video room, is an experience that is also very satisfying, even instructive, because regardless of the investment required, it makes the "State of the Art" of stereo reproduction accessible to the visitor, indicating however the correct way to build it and make it possible, avoiding to disperse resources in less essential aspects for the final result. in our opinion, diversely stimulating. The remarkable Acustica Applicata classic renews itself.  Introduced in the year 2000, DaaDs are reborn in their new Mark II release with a redesigned internal construction for improved performance. 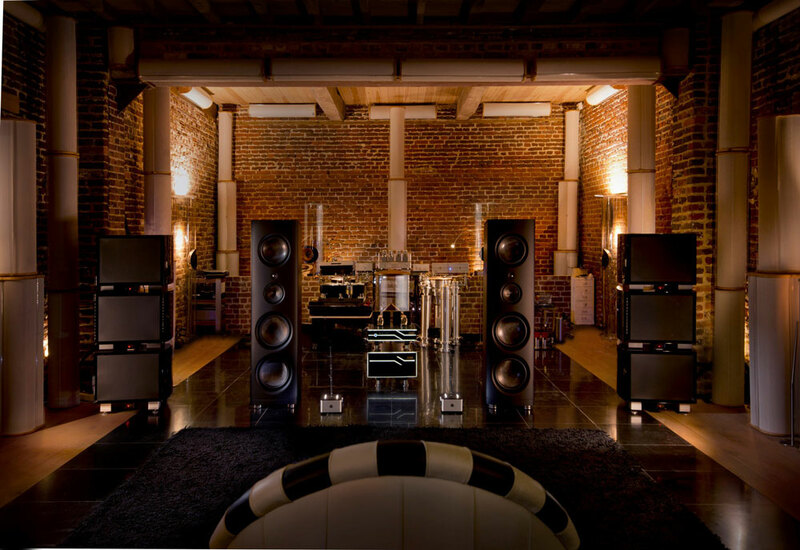 Throughout their sixteen years, thousands of DaaDs have been installed in the finest sounding rooms around the world. They are still the most versatile and efficient device for modern acoustic treatment in high fidelity listening environments where superlative system performance is demanded. Aesthetically DaaD Mark II’s are identical to the original series; the important structural improvements are inside each DaaD Mark II model. The only visual difference is the new gold label, replacing the previous silver, and bearing the name Mark II on our classic oval. After extensive in-depth research, we have replaced and reconfigured the original internal layers of acoustic material with innovative modern fibers. These materials are an exclusive progressive structure, the result of years of study into the microscopic infrastructure of synthetic fibers. Broad band absorption is even smoother than before, with an overall 20% increase in the efficiency of each DaaD II. Increased efficiency means fewer devices are needed to achieve the same result while increasing the effectiveness of each DaaD II in its respective position within the room set up. This translates into lower average cost of each acoustic installation, while also achieving a more powerful result. Our new internal materials are totally no-toxic, do not emit micro-particles into the air even after many years of use, and do not gradually yellow when exposed to direct sunlight. This insures both the long term functioning of our unique absorption/diffusion technology and the retention of each device’s cosmetic beauty. 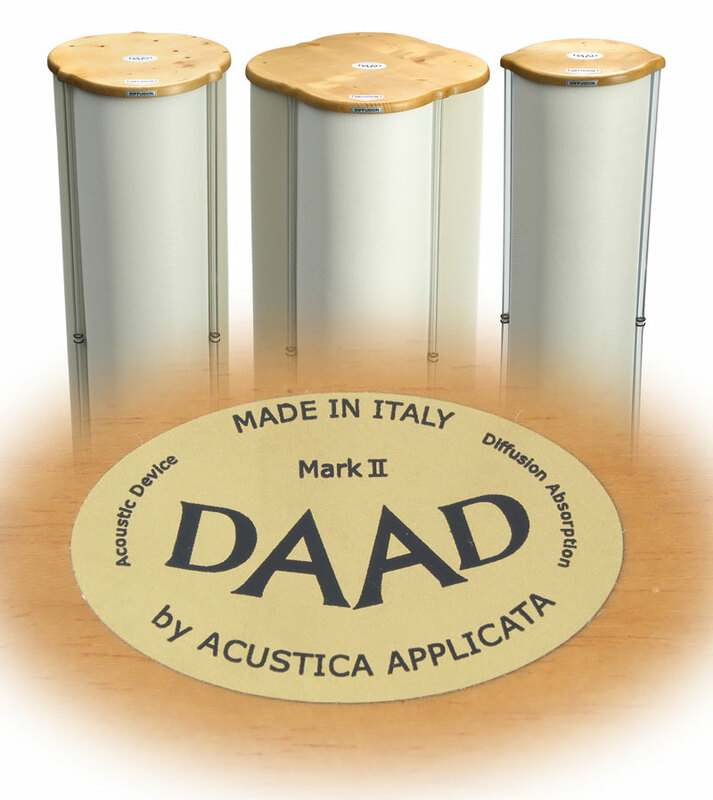 With our new series of DaaD Mark II models, in addition to the tunable variable resonators Polifemo and Volcano, Acustica Applicata reinforces its supremacy as the most sophisticated and evolved range of products for acoustic treatment, specifically developed for high resolution playback in the home and recording studio.